Last Saturday the first edition of 'The Fight Game with Jim Lampley' was aired live on HBO. The show saw Jim Lampley talk to various guests within the boxing world about some of the topics of the sport. At the very end of the show, Lampley showed us his 'Gatti list' which is a list consisting of some of the active boxers who provide us with the most entertaining fights. I can't remember all of the names in Lampley's 'Gatti list' but I do remember who Lampley placed at the top spot in his list, Floyd Mayweather Jr. I know Mayweather had a very entertaining fight with Miguel Cotto recently but, is he really the most entertaining boxer INSIDE of the ring? I don't think he is. 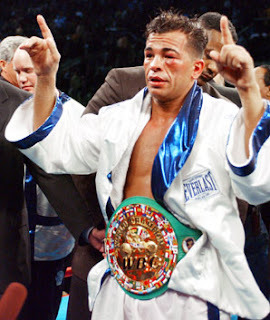 Anyway, here is our list of 5 fighters who we think is worth of a place in the 'Gatti list.' The list is in no particular order. Marco Huck - He's never in a boring fight, and his recent two fights are both 'Fight of The Year' candidates. The 12th round of his fight with Ola Afolabi has been described as 'like a 12th round of a Rocky movie' by the commentators watching that fight. The exchanges were brutal and Huck's fight with Alexander Povetkin has been called 'one of the best Heavyweight fights in years' by boxing fans and pundits. Miguel Cotto - Whether he wins or loses, Cotto always entertains us fans. His three losses to Manny Pacquiao, Floyd Mayweather and Antonio Margarito, and his wins over Shane Mosley, Zab Judah and Antonio Margarito 2 were all very entertaining fights. Cotto has been rumoured to fight Alvarez later on in the year, and that fight has the potential to be an all out brawl. Kelly Pavlik - Pavlik had a great run of wins in 2007. He beat Edison Miranda once and Jermain Taylor twice, and in all three of those fights Pavlik stood and traded punches with his opponent. Pavlik has also had some very eye-catching knock-outs which add to the entertainment value. Pavlik is on the comeback trail so there is more toe to toe action yet to come. Manny Pacquiao - Pacquiao has been involved in some excellent fights with Juan Manuel Marquez, Erik Morales, Marco Antonio Barrera, Miguel Cotto and Antonio Margarito. Pacquiao's fast hands, great power and chin make him one of the most entertaining prize-fighters today. He has a fight coming up with Timothy Bradley which might not be a very entertaining fight, but you know Pacquiao will give it his all.